Who said beauty's skin deep? Snakes, skeletons and other creations. The point of impact…. with 11 mm fangs, this Taipan injects enough venom in a single bite to kill 50,000 mice. 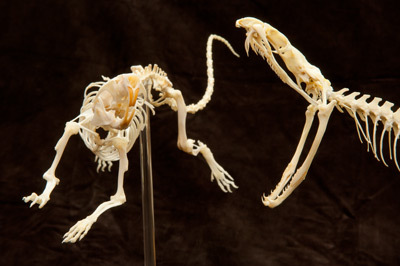 The skeletons of a Coastal Taipan and rat cleaned and bleached with sodium perborate. 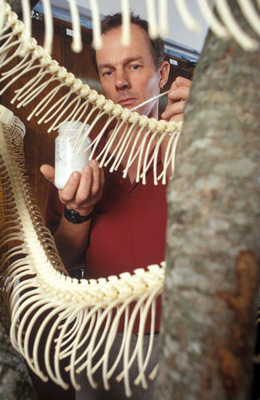 Patrick Couper (Curator of Herpetology) putting the finishing touches to the skeleton of a 5.8 m Reticulated Python. 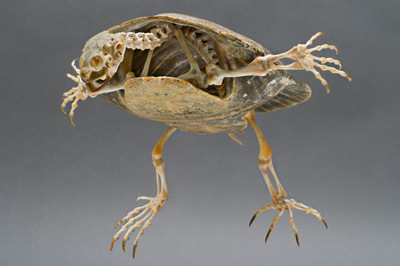 Baring it all… the Skeleton of an endangered Mary River Turtle, Elusor macrurus, prepared for display using dermestid beetles.